Mozilla Tech Speakers is a program to bring together volunteer contributors who are already speaking to technical audiences (developers/web designers/computer science and engineering students) about Firefox, Mozilla and the Open Web in communities around the world. We want to support you and amplify your work! 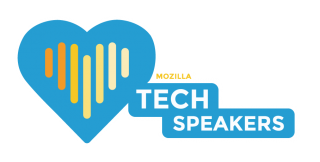 As Mozilla Tech Speakers, participants have an opportunity to work on public speaking skill development with a cohort of technical contributors from many countries. Mozillians old and new, and our allies across the open web, at all levels of experience in public speaking and at different stages in their careers, are welcome to apply. Most participants are not native English speakers, but at this time you must be willing and able to communicate in English to participate in this program. Practice and constructive feedback in a safe and friendly environment are at the heart of how we work together. We are always experimenting with the design of this program, learning from participant feedback, with the aim of being able to grow to meet the global demand for this type of training. All our activities must respect this code of conduct. How to find events, submit talks, and request sponsorship from the program. A collection of documents and assets to be used and reused in talks and workshops. TechSpeakers Appearance Calendar – The calendar where you can announce your appearance, so we know about it! Event Feedback Form (2019) – The form to fill after an event - it tells us how it went. Event Feedback Form (2018) – The form to fill after an event - to tell us how it went. Program objective: Increase developer awareness and adoption of the Web, Firefox, and Mozilla through a strong community-driven technical speaker development program. We currently don't accept new application, but we are planning to onboard a new cohort of Tech Speaker in Q4 2018. Please follow the Speaking category on Discourse for the latest information on future training for Tech Speakers. Grow a base of qualified and well-informed volunteer speakers. Support volunteer technical evangelism efforts with training for speaking and creating presentation materials. So that contributors can present timely, relevant technical material at regional developer events. Volunteer speakers gain skill and experience as public speakers and gain access to information and funding when representing Mozilla at developer events, and at relevant regional, educational, and community-run events. Mozilla has a global team of trained speakers to send to conferences, to host workshops, and represent the project in other technical contexts. Speaker materials and assets become easily discoverable and accessible (content and templates). Graduates replicate the program in their regional communities. Tech Speakers is a six-week program supported by the Developer Relations team, part of the Emerging Technologies group. Originally, our program was by invitation only. Now we are growing the program through an application process. Our vidyo meetings focus on group speaking practice and sharing constructive feedback. Active Tech Speakers who've completed the Tech Speakers program are expected to deliver 2 talks or workshops per quarter, in order to maintain their active status. Develops a talk or workshop or training on that topic over the course of the program. Submits their talk to a conference CFP, presents at a meetup or other relevant gathering. Applications are currently closed. We will announce any new cohorts on Discourse. Regularly submit talks, workshops, or training session. Get help and advice from the program members and staff. Simon Sinek- Why good leaders make you feel safe "Leadership is a choice. It is not a rank..."
The 26%: Facebook’s Mary Lou Jepsen Says Tech is Hostile to Women "When someone tells you something is impossible, it really means they're a little bit jealous, and keep going, you're on the right track..."
This is a partial list of people who have completed the Tech Speakers program. If you completed one of the Tech Speaker cohort trainings, you are welcome to add yourself and a link to your Reps or Mozillians page, or other relevant profile or contact info. This page was last modified on 4 January 2019, at 17:42.